Last night was our Bunko. Here's something creepy - I talked to my mom on the phone en route to Bunko and guess where she was headed? HER BUNKO. Like mother, like daughter. If you know me and know that I am cold most of the time, then you can figure out why I am so, so excited about this. I've wanted a snuggie for so long but you can't go buy one to actually USE. You have to win it or buy it as a joke. It's pink, to boot - I brought it into work this morning and am wearing it right this minute! And, as if that wasn't awesome enough, C told me he bought me one in blue. He could be joking, but I would happily have a backup snuggie. Why do you think they are buy one get one free when you order them from the television? 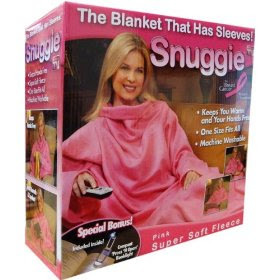 Because if you have one snuggie, you probably need another one. But back to bunko. Even though there were a lot of subs, we had fun and I am excited that it my turn to host next month. Can anyone guess what the theme will be? My guess is American Idol! i am pretty sure your new pink snuggie needs a LJ monogram. homecoming queens? it totally should be, if it's not. :) love you, friend!! the blue snuggie can be for C to wear...snuggie twinkies!